At Let's Party, we focus on providing the party supplies so you can focus on the PARTY and enjoy your special day! 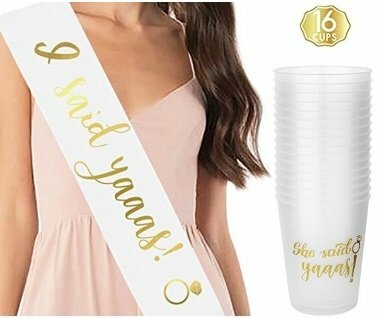 ● (1) "I Said Yaaas" 16 ounce cup for the Bride to Be! ● (15) "She Said Yaaas" 16 ounce cups for the Bride Tribe! - The Bride To Be will love wearing this sash to any pre-Wedding event. - It's perfect for photo opportunities and will be a keepsake the Bride will love! - Each sash includes a cute pin for easy fit & application. - These party cups make great keepsakes when the party is over. - Our cup and sash package is backed by our satisfaction guarantee. - If ironing is needed, please press the sash from the back not the front, and use a moderately warm iron. - If for any reason you are not satisfied, we will give you a full refund. - We would be very excited if you share some photos with us in your review. - STARTING THE PARTY RIGHT: For when She Said Yes just isn't enough... we've got you covered. Our 16 pack (16oz) "She Said Yaaas" + "I Said Yaaas" cups are the perfect supplies to get the party started! - LONG LASTING + REUSABLE: These frost flex cups have been put through rigorous party testing and are 100% guaranteed to last day into night - the perfect bachelorette decoration for the bride to be! - PREMIUM QUALITY: White Sash with Gold Lettering. Our sash is made of double face stain fabric with silk feel and luster. The "I Said YAAAS" font is well designed, Super attractive and elegant. - FITS PERFECTLY: One size fits all sash. Measuring approximately 30 inches long. Each sash includes a cute pin for easy fit & application. - BACHELORETTE PARTY AND BRIDAL SHOWER MUST-HAVE: The Bride To Be will love wearing this sash to any pre-Wedding event. It's perfect for photo opportunities and will be a keepsake the Bride will love. If you have any questions about this product by Let's Party, LLC, contact us by completing and submitting the form below. If you are looking for a specif part number, please include it with your message. Talk Thirty to Me 30th Birthday Party Cups and 1" Talk Thirty to Me Button, Set of 12, 16oz Black and Gold 30th Birthday Stadium Cups, Perfect for Birthday Parties, Birthday Decorations!